Right click the 'DOWNLOAD VIDEO' link and select either Save Target As, Save Link As or Save As. Right click (or CTRL + click) the 'DOWNLOAD VIDEO' link and select either Save Link As or Download Linked File. "Teacher-led classroom walkthroughs are resulting in a professional learning community where teachers feel safe and open to talk about improving student learning based on evidence they observe. We are using the dialogue to improve our practice and monitor our school improvement plan." How can the Equity Walk serve as a catalyst for taking action that results in the continuous improvement of teaching and learning at your school? What are the features of the Equity Walk that make it an effective vehicle for professional learning and improved student achievement? 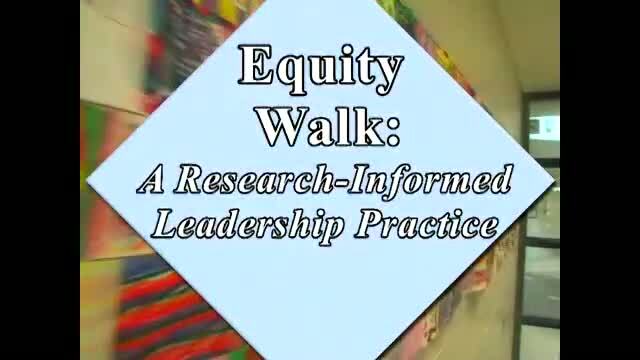 Choose a section of the Equity Walk module and do a "mental walk" through your school. What do you see that supports equity and inclusion? What is missing? What do you need to check for when you do an actual walk through your school? Who might you include in doing an Equity Walk in your school? Who might "see" things that you might not notice? What are some of the areas that you might want to focus on at your school as you begin to plan the Equity Walkthrough?